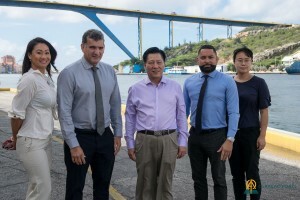 WILLEMSTAD - Recently the General Consul of The People's Republic of China, Mr. Zhang Weixin together with his Vice Consul, Mrs. Wang Qi and the Commercial Consul, Mrs. Ding Cuiyu paid a visit to the Curaçao Ports Authority (CPA). This was a courtesy visit where the management of CPA gave the delegation a presentation of all ongoing projects. The presentation was followed by a port tour. On the picture from left to right: Mrs. Sau Bridgewater-Chong (Manager PR & Communication of CPA) Mr. Humberto de Castro (General Director of CPA), Mr. Zhang Weixin (General Consul of The People's Republic of China), Mr. Raul Manotas (Chief Commercial Officer of CPA) and Mrs. Wang Qi (Vice Consul of The People's Republic of China).